Once again, EXIT is the hub of dialogue, as well as numerous social and charitable activities! In 2006, the European Union Enlargement Commissioner Olli Rehn visited Exit, had fun playing football at the Petrovaradin Fortress and became a citizen of the State of Exit. This year, the Best Major European festival will host another high-ranking European Union official. The representative of the European Commission’s Directorate-General for European Neighborhood Policy and Enlargement Negotiations, Myriam Ferran, will visit OPENS State of Exit zone on July 13, the second day of the festival, due to the zone’s importance as a place where young people from all over the world meet and exchange ideas about regional support and cooperation, which is one of the reasons why Novi Sad became the European Youth Capital for 2019. The European official will also participate in a panel discussion dedicated to the employment of young people in the Western Balkans and Serbia’s accession to the European Union. On Saturday, Myriam Ferran will dedicate her attention to the future creative district, “Youth Creative Polis”, (the so-called Chinese Quarter), on of the key projects of Novi Sad as the European Capital of Culture in 2021. 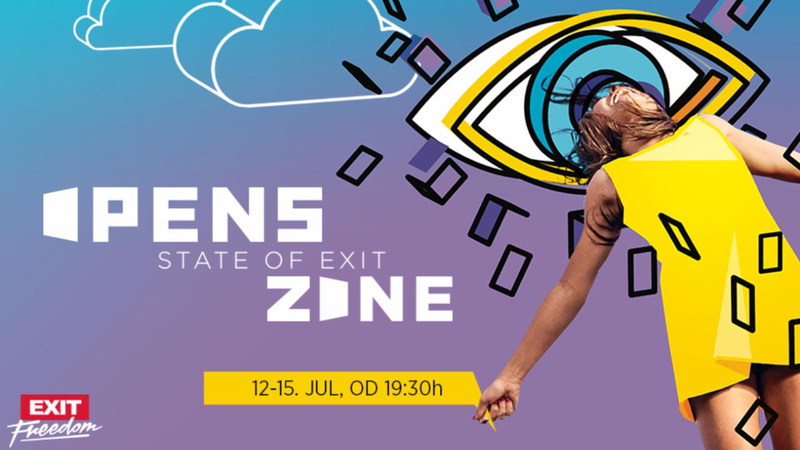 In addition to the visit of the high-ranking EU official, about 50 organizations from the civil sector from the entire region will present themselves at the OPENS State of Exit Zone. For four days, together with the visitors, they will show what freedom means in the most creative and fun way possible, following the motto of this year’s EXIT festival. The second part of OPENS’ “Non-Government Kingdom” will be divided into zones which will feature some great entertainment, such as a small cinema, OPENS VR world and photo booth, basketball court at which the visitors will have an opportunity to test their skills against the best half-court basketball players – Liman 3×3 Tesla Voda. XBOX fun on lazy bags is also included. People will be able to watch short movies, witness mural creation, attend film workshops, dance and have beatbox lessons. Four panel discussions will also be held and the most romantic among us will be able to watch the stars through a telescope, while the conscientious protectors of the environment will participate in creating “Pixelate”, a six meters long tin can mural. Some of the guests of the music conference and panel discussions, which will be held at “Atelje Radošević” below the VIP terrace, every evening from 9 to 10 PM, will be: Miriam Ferran, Director for Strategy and Turkey at the Directorate-General for European Neighborhood Policy and Enlargement Negotiations, Ana Ilić, Advisor to the Prime Minister for Digital and Creative Industries, Film and Tourism, Dragan Ambrozić, Program Editor-In-Chief of Belgrade’s Dom Omladine, Draža Petrović, Editor-In-Chief of Danas, famous local musicians with international careers and other music industry actors. Registrations for participation in these discussions is now available via the email [email protected], and the number of openings is limited. After successful charity initiatives such as “Aces for Children”, which resulted in opening of the hospital wing for children with cancer in Niš in the May of this year, Exit Foundation will use this four-day musical spectacle to continue “Star4Kids” effort of collecting things for charity from the performers. Some of the prominent participants and donors are David Guetta, Skrillex, Motorhead, Killers, and this year’s superstars will also become benefactors. “Youth Cancer Europe”, an international organization which organizes and helps young people of the continent who successfully fought the toughest illness will join the noble mission of the Exit Foundation. Young fighters will be in for an unforgettable experience – thanks to the cooperation between Exit and “Youth Cancer Europe”, they will have an opportunity to meet with their favorite performers at EXIT. Guys, Who is Driving Home? Safe arrival to and from the Fortress is ensured by HEINEKEN, Agency for Traffic Safety and Exit Foundation. They will make it possible for the visitors of one of the best music festivals in Europe to enjoy free taxi service on the territory of Novi Sad. The festival audience will be able to collect taxi vouchers for arrival or return from the Petrovaradin Fortress at the Festival’s Enjoy Responsibly Zone, after participating in a quiz. Through various games, the visitors will have an opportunity to find out a lot about proper behavior in traffic, and everyone who participates in these fun educational activities at the Enjoy Responsibly Zone will be rewarded with useful gifts, which will remind them of the most important messages promoted at this event. This year, with the support of Philip Morris Company, Exit will for the first time be the festival which stands for a world without tobacco smoke. “This year, we wish to enable all the visitors of Exit to enjoy their favorite festival in as pleasant an atmosphere as possible, free of tobacco smoke, and to offer all the smokers who do not wish to quit smoking to replace traditional cigarettes with IQOS, a potentially less harmful alternative. IQOS does not emit smoke, but water vapor which contains up to 90 percent less harmful substances compared to cigarettes. We believe that, if every company starts acting responsibly from their own perspective, we will all manage to create a new, even better and more pleasant festival experience, as well as culture”, said Tamara Stanković, Corporate Communications Director at Philip Morris. During EXIT Festival, Matica Srpska Gallery will organize a program titled “Take a break, feel the Art in the Gallery of Matica Srpska”, whose aim is to promote Serbian art in the European context and make it approachable for foreign tourists. Aside from the exquisite program offered by the festival, the visitors will be able to spend the afternoon getting to know Serbian national art and enjoying the pleasant atmosphere of Matica Srpska Gallery. This cultural institution of national importance will also be presented at the festival itself, at the OPENS State of Exit Zone where the event titled “The Art of Freedom” will be organized. The visitors will have an interesting opportunity to add their messages about freedom next to the reproductions of works of art and share this on social networks. “Balkanac” youth organization, which brings young people together in order to connect them, promote positive examples of tolerance and peace, informal education, culture and ecology continues shooting the material, after visiting Festival 84 at Jahorina and Sea Star Festival in Umag, for their new documentary which will celebrate living in unity and good neighborly relations. after visiting Festival 84 at Jahorina and Sea Star Festival in Umag. A euphoric EXIT night gathers 52,000 people, tonight brings the great finale! The Exit adventure continues with historic spectacle by the prodigy in front of 35.000 fans! The Prodigy tonight at Sea Dance festival – all’s set for the Jaz beach spectacle!